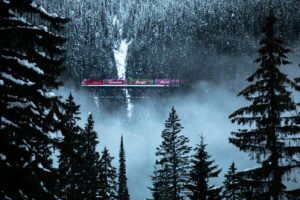 CALGARY – The Canadian Pacific (CP) Holiday Train has completed its 20th journey and has given communities across North America reason to celebrate in support of the important work of local food banks. While final numbers are still being calculated, the program is on track to raise more than C$1.3 million and collect over 200,000 pounds of food for local food banks and food shelves. The Holiday Train has now raised more than $15.8 million and collected 4.5 million pounds of food since its inaugural journey back in 1999. “To run a charitable program of this magnitude for 20 years is a tremendous accomplishment for our CP family, and a testament to our dedication to giving back to the communities where we work and live,” said Keith Creel, CP president and CEO. The 2018 CP Holiday Train featured a highly acclaimed musical lineup. The U.S. train kicked off with the Juno Award winning Sam Roberts Band and JoJo Mason performing at stops in Quebec, New York and Ontario. Hit makers The Trews and Willy Porter hopped on board to complete the U.S.-bound train’s voyage. On board the Canadian train, recent Canadian Country Music Hall of Fame inductee Terri Clark was joined by Kelly Prescott and Sierra Noble as they entertained communities from Montreal to Calgary, where the Sam Roberts Band replaced Clark to finish the tour to the west coast. In addition to the local food banks that benefit from the Holiday Train, CP has been an active partner of Food Banks Canada since 1997, before the CP Holiday Train began. Each year, CP provides Food Banks Canada $250,000 worth of in-kind transportation services to support its National Food Sharing Service program. This year, with the donation of a CP TempPro refrigerated storage and transport system, Food Banks Canada was able to move a million pounds of food that included fresh, frozen and perishable items by rail. “Our partnership with CP is invaluable, especially during the holidays, and the CP Holiday Train is such a fun way to raise food and funds,” said Chris Hatch, CEO, Food Banks Canada. Day & Ross buys Stonehammer Transport Inc.